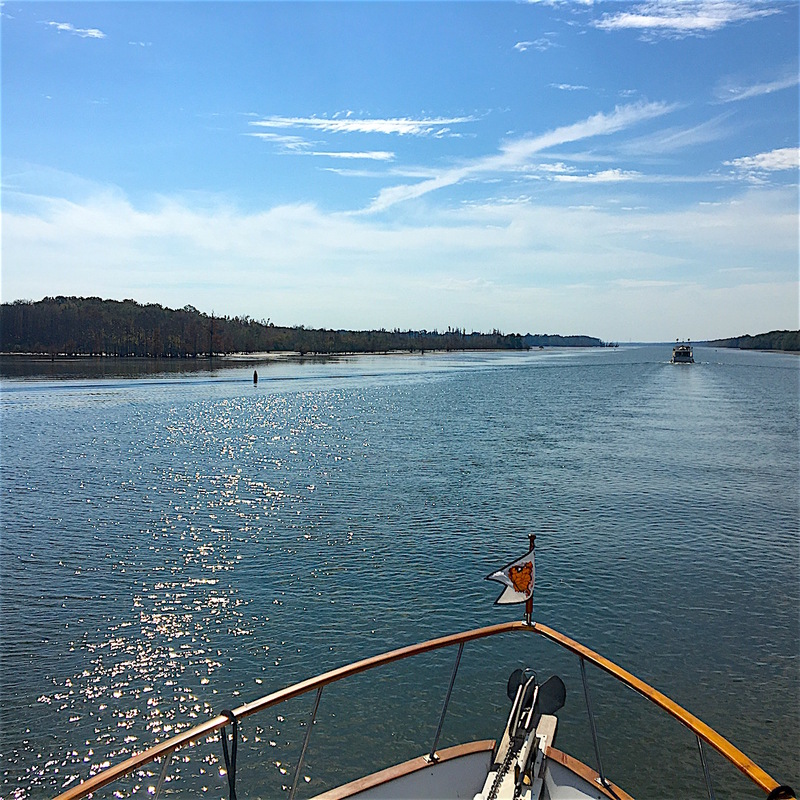 10/1 – 8/2016 Summary: When we pulled into Aqua Yacht Harbor, on November 1st, we had technically left the Kentucky Lake and started down the Tennessee-Tombigbee Waterway (Tenn-Tom), the start of the remaining 450 miles to Mobile, AL, half of which was on the Tenn-Tom. 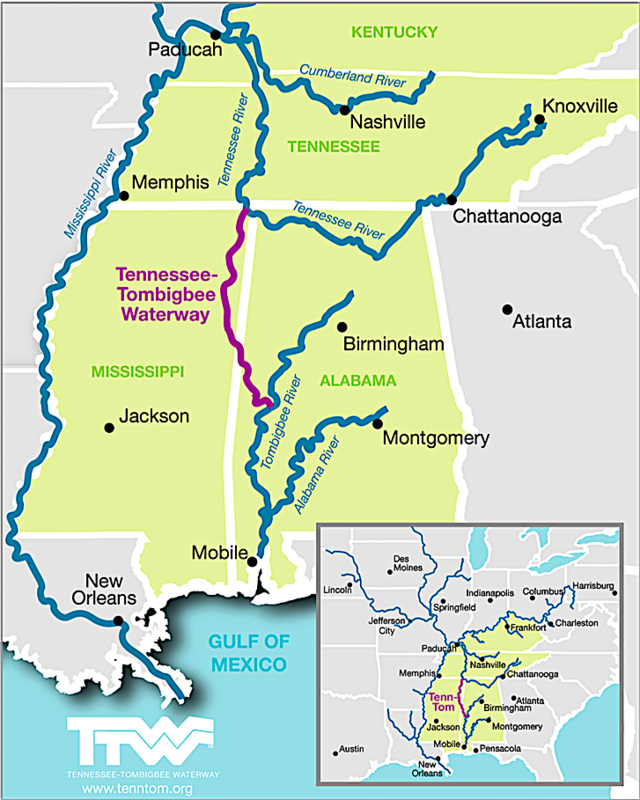 The Tenn-Tom varied from somewhat boring (in Tom’s opinion) to peaceful (in Paula’s opinion), but for the most part was a combination of manmade canals and lakes. We stopped at several marinas along this stretch, but also discovered some beautiful anchorages (sunset picture above). We found the development of the waterway interesting. 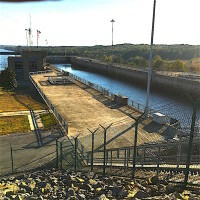 With 9 locks, it is 5 times longer than the Panama Canal. 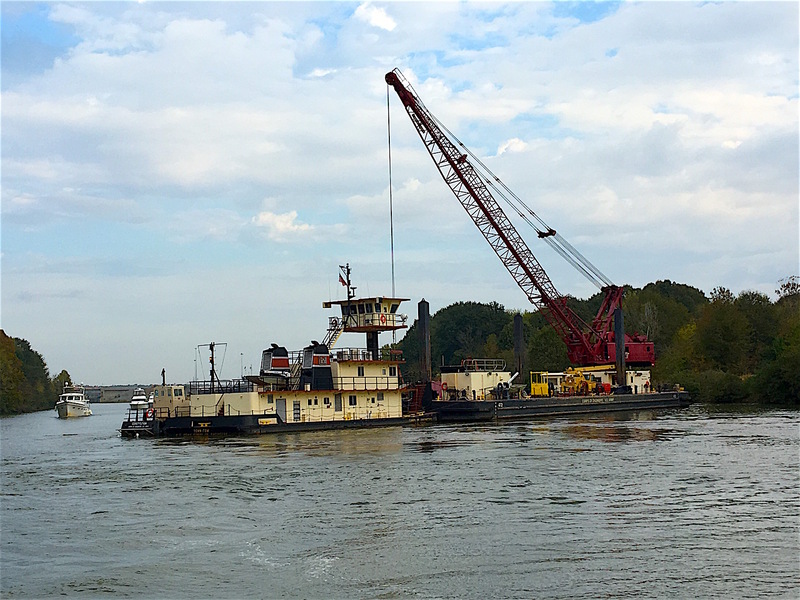 We visited several visitor centers along the way, one with a retired steam-driven paddle wheeler used as a snagboat, removing debris from the waterway. But most fun was the number of people we met through this section, many of them new Loopers. 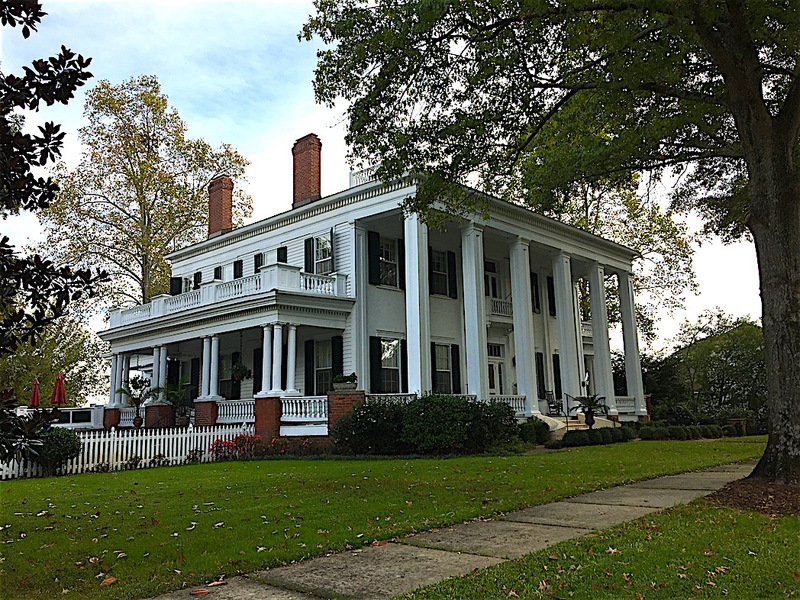 One of the highlights was touring the Waverly Mansion where we were guided through the home by Melanie Snow, daughter of the family who restored this 1850’s antebellum house she still calls home. 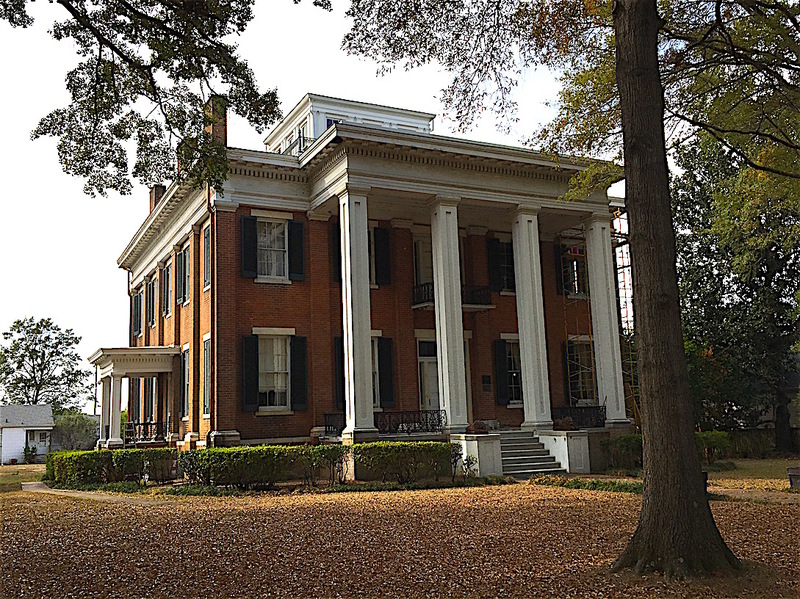 It sat vacant for 50 years, but amazingly, none of the windows were broken. As we neared the end of this section, the terrain changed somewhat to higher riverside cliffs rising from the water’s edge. Extending for several miles, the White Cliffs of Epes were a stark contrast to the levee-lined canals in the upper section. Interestingly they only displayed on one side of the river. 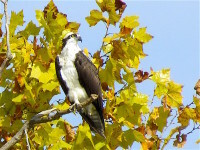 We saw a little more wildlife as we descended the river system. There were bald eagles, osprey, great blue herons, great egrets, kingfishers, and the first gulls we had seen in some time. We watched a bald eagle take a fish from the river right in front of a big barge. There were turtles along the banks sunning themselves on logs, but splashing into the water as soon as we got near, 2 deer, and even wild pigs. Some sections were lined with houses, but often we would go for miles with nothing but trees along the banks. Since there were fewer places to stop, we had some short days (20 miles) but we also picked up the pace a bit and did a few 50 to 70 mile days. Okay, you can stop reading now unless you are one of the few who reads the details. We do have a few more pictures this time to browse. Thanks for stopping by. 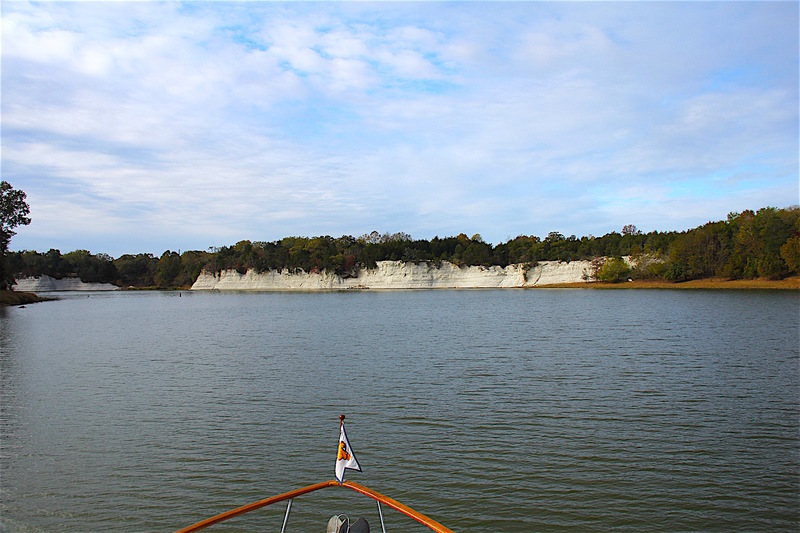 Detail – We left Aqua Yacht Harbor about 10:00 and rejoined the Tennessee-Tombigbee Waterway (Tenn-Tom). From behind an island came Tidings of Joy, a 52’ DeFever we first met in the Georgian Bay in Canada. 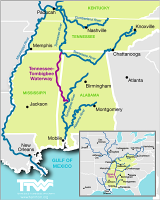 The Tennessee-Tombigbee Waterway (Tenn-Tom) links the Tennessee River with the Tombigbee River which flows in Mobile Bay at the Gulf of Mexico. It was the largest civil works project the US Army Corps of Engineers ever completed – 5 times longer, with a lift of 3.5 times more (341’) than the Panama Canal. 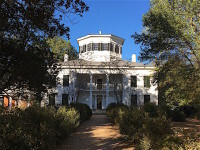 Though originally conceived in the early 1700s and first surveyed by the federal government in 1874, the Tenn-Tom was not actually completed until 1984 after 8 studies, 22 presidents, 55 sessions of congress, and 12 years of construction. The initial estimate was $1.7 million; final cost, $2 billion. The 234-mile waterway was built with a minimum width of 300 feet, a minimum depth of 9 feet, and included 9 locks. It cut 665 miles off the trip from Knoxville, TN to Mobile Bay, AL, 400 miles from Pittsburgh and 144 miles from Chicago. 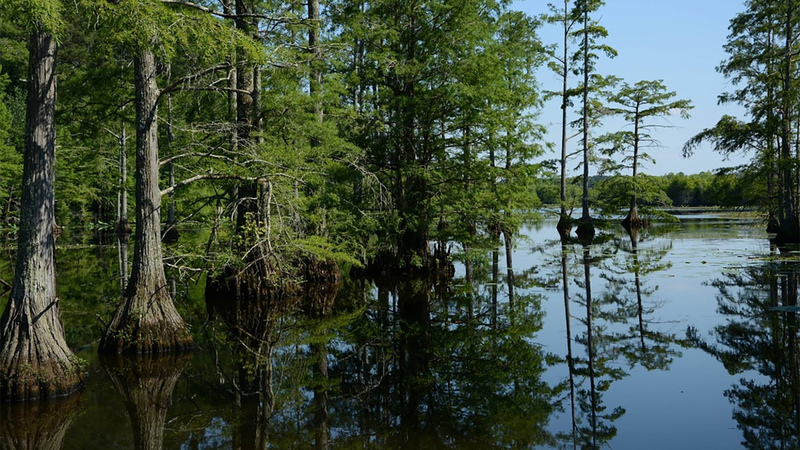 It had frequent marinas, many beautiful anchorages, less commercial traffic, and was primarily slack water, lacking the current of the Mississippi and other rivers. We motored along with Tidings of Joy through the 27-mile canal of Divide Cut. Tom thought the canal was boring but Paula found it peaceful. 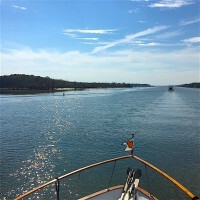 We traveled 36 miles, stopping just one cove after Tidings of Joy to anchor for the night a half-mile before Whitten Lock, the first lock on the Tenn-Tom. There were so many pretty anchorages in that area known as Bay Springs. Shortly after we anchored, sailboat Mystic pulled in and we met Dave & Beth Rogers, a sweet young couple who began their Looping in Minnesota. We put the dinghy in the water and went around the point to the Bay Springs Visitor Center. Though small, it had some nice exhibits on the history of the area and a very large relief map of the Tenn-Tom Waterway. There were recordings highlighting locations along the Tenn-Tom with interesting details. 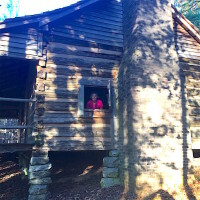 On the trail to the lock we passed Butler dogtrot cabin, which had been moved there when the dam was built. 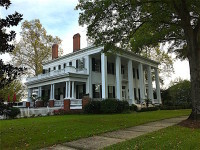 Dogtrot is a design of house common in the Southeast during the 19th and early 20th centuries. 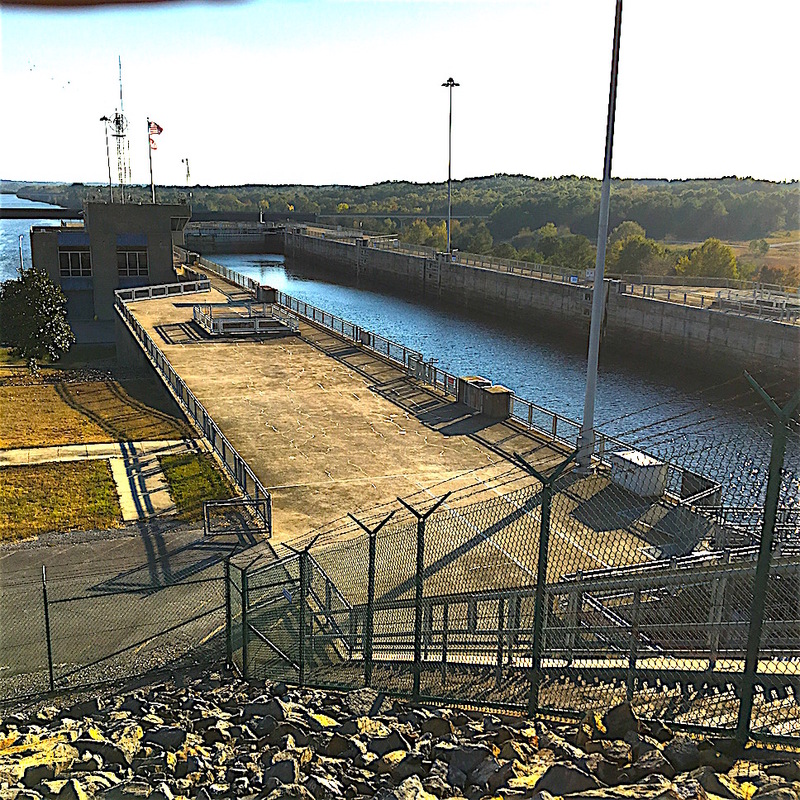 In the morning, Tidings of Joy called Whitten Lock to see when we might be able to lock through. The lockmaster said he could take us immediately, so we all 3 pulled anchor and were in the lock in 20 minutes. In Deep Ship, another Looper, joined us and we locked through 3 locks (within 14 miles) together with no wait. Shortly after the lock, we came to a dredge which seemed to block almost the entire river. There was a thin overcast, but temperatures were still lovely and about 10 degrees higher than normal. We were happy to take the warm weather as long as God provided it! And the cool evenings were great for sleeping. We made a short day of it (only 19 miles), stopping at Midway Marina near Fulton, MS so we could get some Internet service. So far along the Tenn-Tom, even phone service was sketchy. The marina was very small and we pulled up to the end of a dock where they indicated, but the power would not work. So instead, they gave us a covered slip nearby and then, apologizing that we had to move, only charged us $25 (it would have been $44) for our trouble. They were great folks. We met Tom and Cassie Padon, Gold Loop owners of Seawolf, a beautiful Cheoy Lee 40 in the slip next to us. When we found out they spent 1.5 years exploring the Chesapeake, we told them we’d love to talk more, as we had sped right though it but planned on spending more time there next time around. Shortly after, they issued a dinner invitation for a Mexican restaurant nearby. 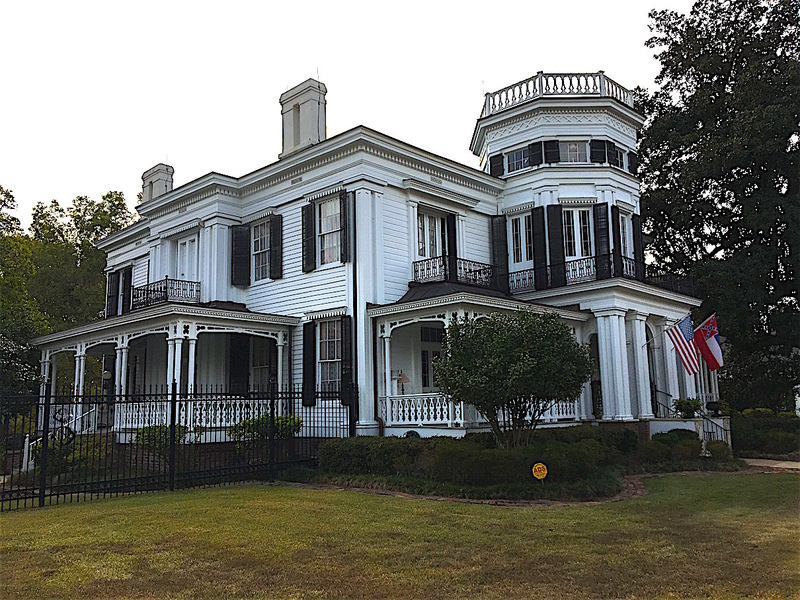 We got down our bikes and rode to the Whitten Historical Center, downriver 2 miles, named for a Mississippi congressman who supported the Tenn-Tom construction. George Wilson (the dockhand, not Dennis the Menace’s neighbor) told us about a path through the woods and adjacent campground to the center. It was a lovely day and we enjoyed the pretty path. At the small center, there were displays and some videos about the area and the job of the US Army Corps of Engineers. Returning to the boat, Tom did some boat work then sat down on an aft deck chair to rest for just a minute or two. An hour later he awoke with a stiff neck. At 5:00, we were off to Mi Torro with Tom and Cassie for dinner. We talked about boats (theirs was a 1970s project boat which they were lovingly restoring and when we got to tour it later, we saw what beautiful teak work Tom was doing), the Chesapeake (they gave us ideas of their favorite areas), touring (they had been to Trinidad and Guatemala) and how much fun it was to meet other Loopers. They were sweet folks and we enjoyed our evening together. We planned to pull out the next morning at 8:00 with our entourage of the day before. At 7:25, Tom turned on our radio and heard the Fulton lockmaster inquire if anyone at Midway Marina wanted to lock downriver. After a short conversation, we found out we’d have no delay if we went right away. Paula quickly informed the other boats while Tom got our boat ready and in 13 minutes, we were out of the slip, with Tom and Cassie’s help. The other boats made it out about 5-10 minutes behind us and we joined 2 other boats in the lock (a total of 7 boats), which did the next 3 locks together. The sky turned from cool and overcast to hot with scattered clouds. The scenery was a bit monotonous – narrow canal, tree-lined banks, occasional stumps to the side, and levees. After our third lock of the day, we left the Canal Section and entered the River Section, but for the most part, it was still pretty monotonous. More deadheads showed up in the river, but nothing was difficult to avoid. At mile 337, we stopped to anchor at Waverly Island, but after 3 tries, our anchor would not grab in the soft mud (but the mud did grab and broke the anchor buoy). With little daylight left, we continued 3 miles further to Columbus Marina and tucked into a slip. 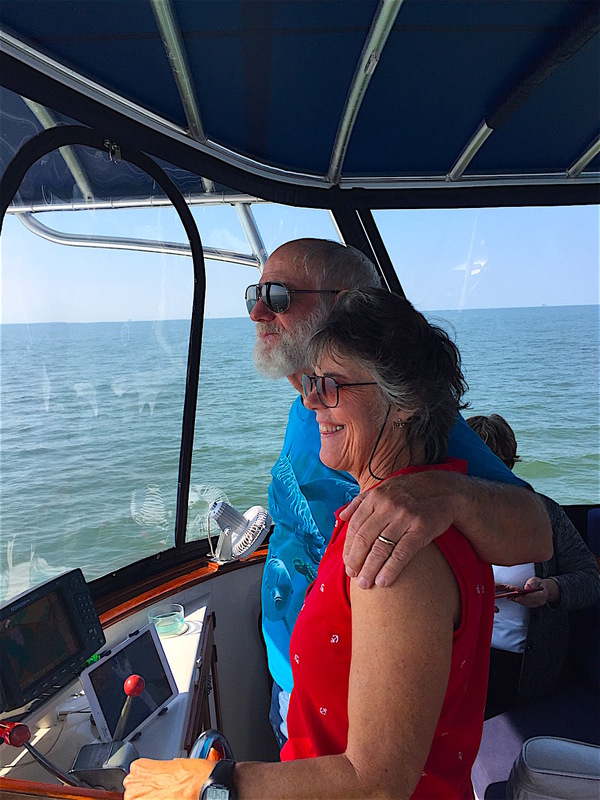 We met a few other Loopers – Jim and Linda Mumper on Leilani and Byron and Cindy Miller on Bright Angel (named for the trail in Grand Canyon), and then Tom grilled delicious pork chops on our aft deck. The itching on Paula’s head had subsided, but returned along with a rash on her back. 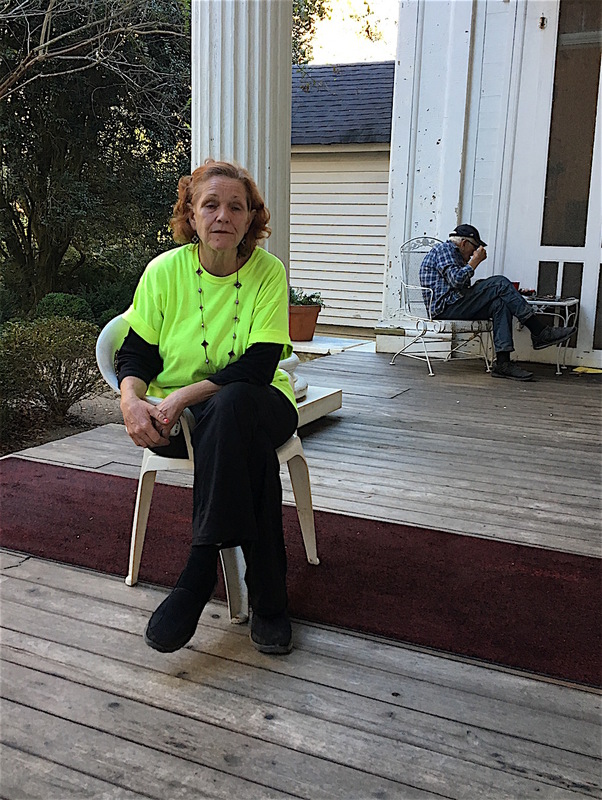 We talked to the dockmaster, T., who was very helpful and tried to get her an appointment with a dermatologist (which was what she really needed), but was unsuccessful. T. lent us his personal truck and we were off to another urgent care facility. We were not as fortunate as the previous time as we had an hour wait, but left with Paula having gotten another shot and 3 more prescriptions to fill. But thanks to her brother, who is a dermatologist, she was able to get yet another prescription for a longer period, which ultimately solved the still unknown problem. On the way back to the boat, we split a BBQ plate at The Little Dooey with a good vinegar-based sauce. Paula took a short nap (one of the prescriptions was sleep-inducing) while Tom picked up an Enterprise rental car, then we were off to tour Waverly Mansion. Begun in the 1840s and completed in 1852, Waverly Mansion was a National Historic Landmark Greek Revival home, distinguished by the immense octagonal rotunda on its roof. 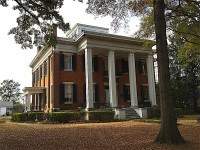 The antebellum home was originally owned by Col. George Young who had 10 children. 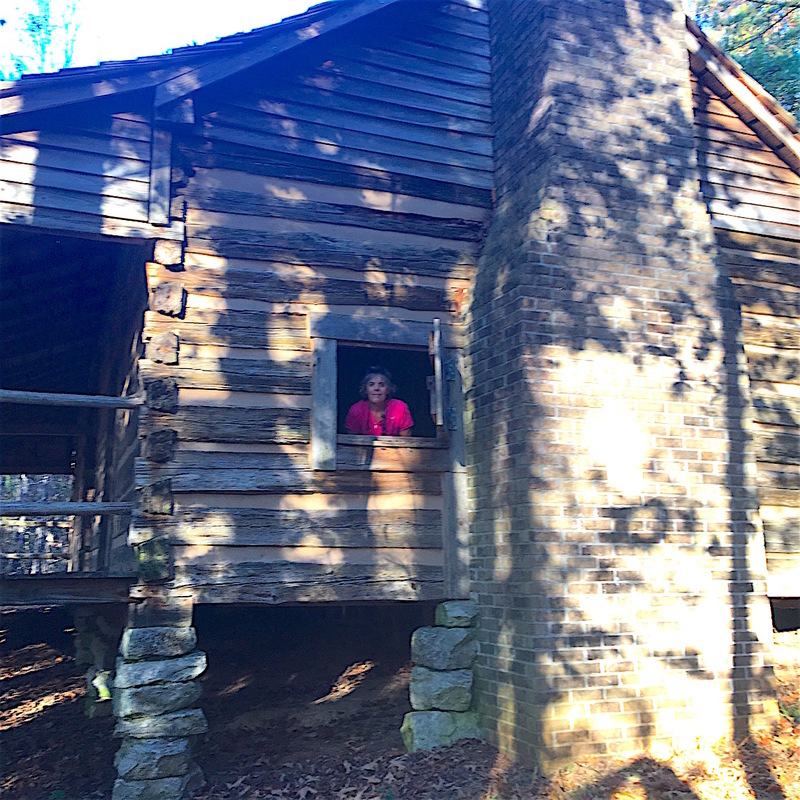 It was a self-sustaining community with 100 slaves, gardens, orchards, livestock, a lumber mill, and tannery and hat-manufacturing operation. 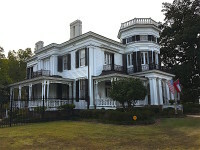 We were guided through Waverly Mansion by Melanie Snow, a lovely southern woman whose parents, Robert and Donna Snow, bought and began restoring Waverly in 1962 after it sat empty 50 years. 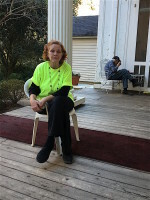 She was an excellent guide, so knowledgeable and proud of their house. Though the home had no original furnishings, the antiques collected by the Snows were extraordinarily beautiful. Melanie and her 92-year-old father (who we saw) lived in the house and continued to care for it. On our way back to the boat, we stopped at Hanks #1 BBQ for a prize-winning taste. The south sure does have some great-tasting BBQ! We did some planning once back at the boat and decided the remainder of the river system was not going to require as much time for sightseeing as we had allotted. Instead, we decided to do about 50-mile days the rest of the way down to Mobile, allowing us to spend a bit of time sightseeing once there and get some boat work done. We really had not done any major work since February when we left Florida, 10 months prior. Saturday was a local sightseeing day. We started at the Columbus Convention and Visitors’ Bureau, which also happened to be the childhood house of Tennessee Williams. 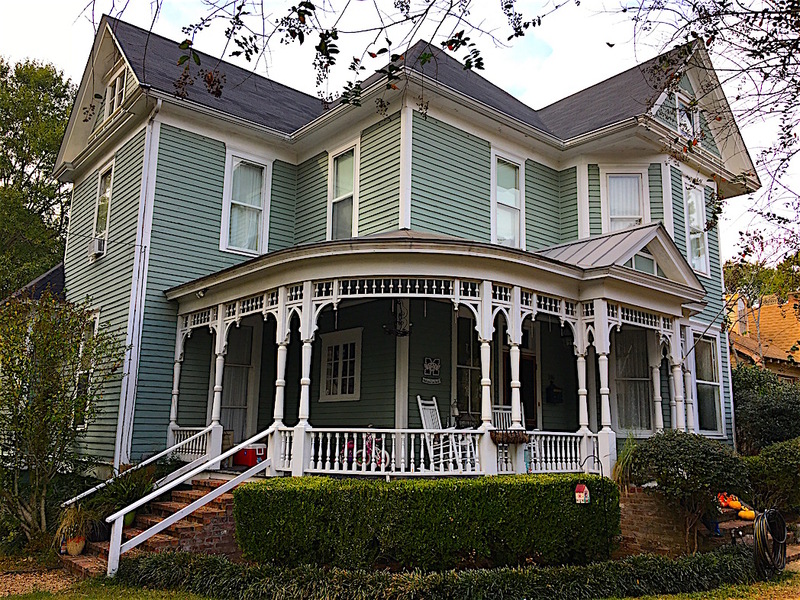 Playwright Williams is famous for plays like Cat on a Hot Tin Roof, Streetcar Named Desire and the Glass Menagerie. Upstairs in the house, his life story was appropriately told as Act 1, Scene 1, Act 1, Scene 2, etc. 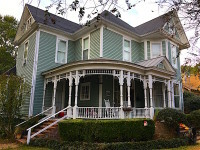 Then we walked the neighborhood of beautiful historic houses in many styles. 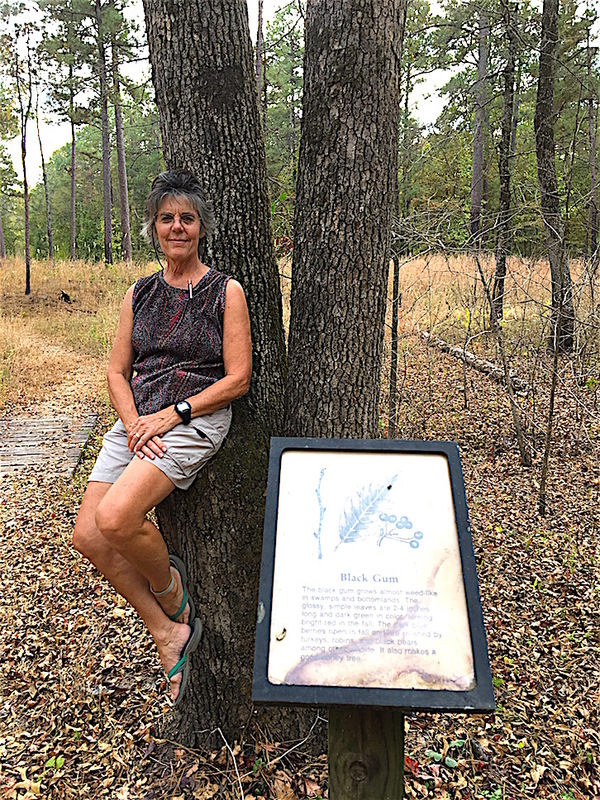 We drove about 20 minutes to Starksville, home of Mississippi State University, and on to the Noxubee National Wildlife Refuge. We hiked Woodpecker Trail and read about the tree types on the trail. Then it was on to the Noxubee Visitors Center. Dinner was at Zachary’s, the “best burgers place in town” according to the gal at the visitors bureau and we had to agree, they were great. As we were leaving, 4 USAF pilots came in. We stopped to talk with them. When Paula told him she had about 17,000 hours, you should have seen their postures change! It was pretty funny. Back at the boat, we were supposed to visit with Dave and Beth, the small sailboat Loopers, but Beth had fallen asleep, so it was off. Those young people, you know, just can’t keep up! Actually, it was interesting. Recently, we had been meeting quite a few boaters who were just starting their Loop. It caused us to reflect on how anxious we were when we first began. Everything was so new and keeping up with route planning and plotting, how far to go, where to stop, weather, grocery shopping, laundry, etc. seemed a full-time, all-consuming job. And it was quite tiring! That’s where Dave and Beth were, having started in Michigan with a bit of the bad weather there. We were happy to be much more relaxed (finally) about the whole thing. Though all that planning still took time, it was done with less angst than in the beginning. Interesting, upon our arrival, the visitors center hostess asked if we were Loopers. We asked how she knew. She said Loopers had “a look,” relaxed and happy. That was us. We found a great church on Sunday – Vibrant Church. And it was. We thought it was a church Jesus would like if He wandered in. There seemed a wonderful mix of ages, races, and backgrounds and the message was on unity, which the pastor said was a distinctive of their church. It seemed so. Back at the boat, Tom put LC back on the dinghy deck and attracted the interest of a fellow Looper, Tom Hanaway, who we would get to know well in the days to come. We called Stennis Lock to see if we could lock through if we left Columbus Marina. He said he had 2 in the lock right then and if we could get off in 15 minutes, he would wait for us. We hurriedly prepared to leave, and Dave and Beth came over to help with lines and say goodbye. Though it was an overcast day, the temps were still perfect. 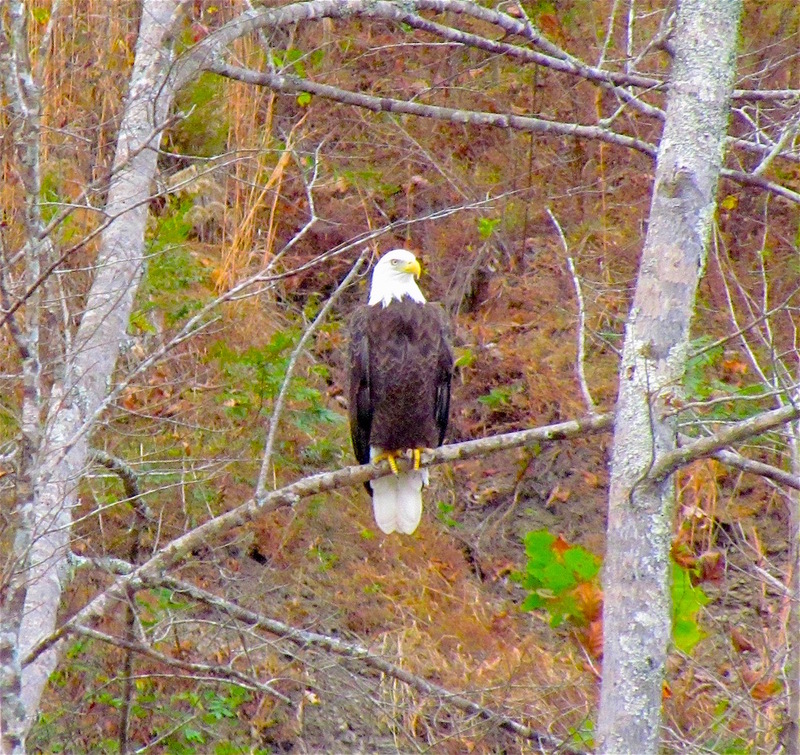 We saw 1 eagle, and traveled 28 miles down the Tenn-Tom to just above Tom Bevill Lock and Visitors Center. We planned to visit the next morning but unfortunately the lockmaster said it was only open Wednesday through Saturday. We were treated to a glorious sunset (which occurred earlier, having just come off daylight savings time – top picture ) and we were able to listen to KLUV Christian radio all day – a perfect day on the Tenn-Tom. In the morning, we locked through Bevill Lock at 7:30 with no wait along with My Inspiration, Darrin & Tammy Hemphill and Tammy’s 84-year-old dad, 4-day Loopers who had joined us at anchorage. It was a beautiful cool morning but warmed quickly so we were back in shorts and T’s by 10:00. Again, we were so grateful for our continued amazing weather. We heard later on the radio there had been no measurable rain the area in the last 50 days! Shortly after leaving the lock we came to a large barge with its bow on the bank, turned sideways, almost blocking the entire river. 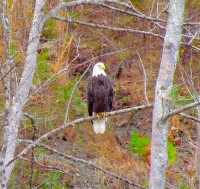 He was waiting for a downbound barge to pass, but as we approached, was kind enough to move over a bit so we could pass. 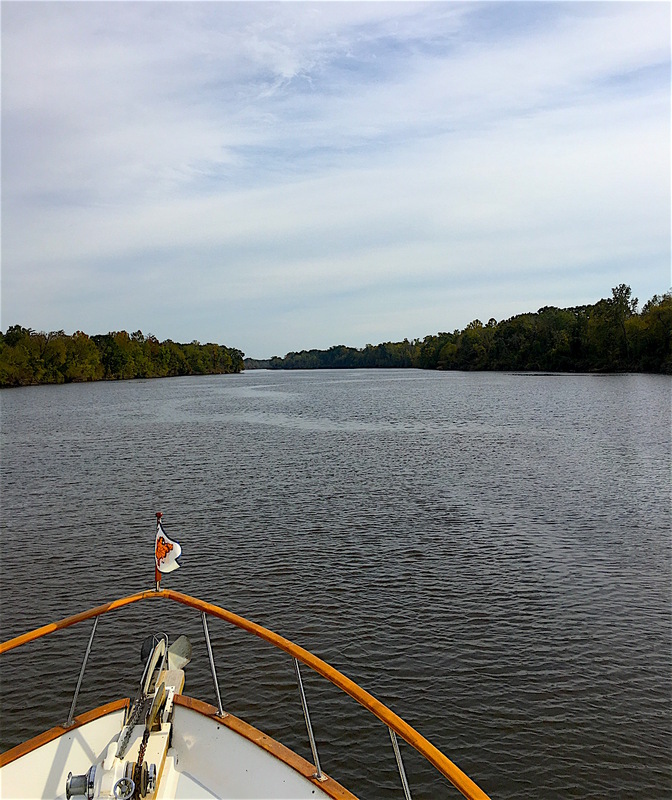 We boated 41 miles to the Tombigbee Oxbow at mile 266, seeing lots and lots of turtles and 1 bald eagle before we turned into our anchorage. We passed through Heflin Lock alone, a first in a long time. It was another very convenient anchorage, just off the channel, and we had it all to ourselves. We arrived at 1:15, but the next available anchorage was another 4 hours downriver (past dark by the time we could have made it), so we amused ourselves with 2 games of Qwirkle (and Paula was on a roll again). As we traveled the rivers, we were on the constant watch for barge traffic. We could see them on our AIS (Automatic Identification System), but they could not see us, plus they had priority in the locks, so good timing could save hours. Did you know an average 8-barge tow can move as much freight as 120 rail cars or 480 tractor-trailer trucks? A barge can move a ton of freight twice as far as a train and 6 times as far as a tractor-trailer truck on the same amount of fuel. The leading commodities transported on the Tenn-Tom were wood products, coal, crushed rock, chemicals, steel, fuel, iron ore, salt, cement, logs, and asphalt. 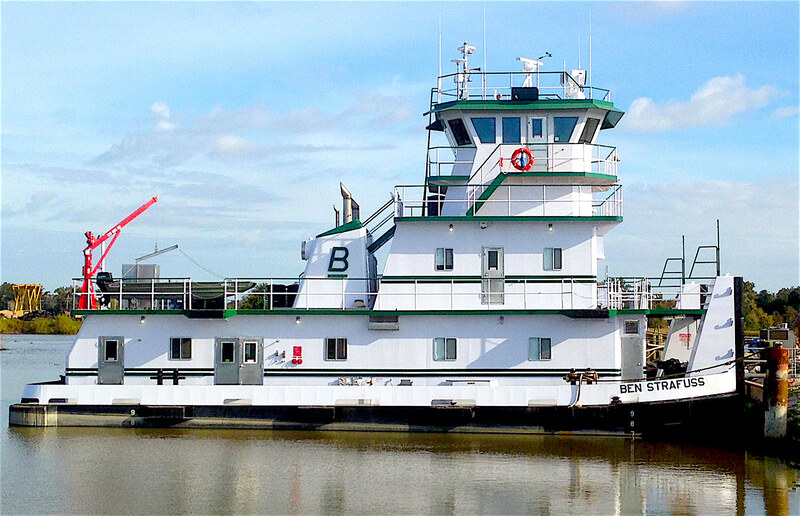 The boats that push them are often call tugboats, but are really “push boats.” They range from huge, like the ones on the Mississippi, to very small ones used to push barges around while mating them together in larger groups. We left our anchorage at 6:45 on Tuesday for a 50-mile day to the Kingfisher Marina at Demopolis Yacht Basin. Demopolis, AL was the last reasonably sized town we would pass on our way to Mobile. Along the way, we saw lots of turtles, passed some short limestone cliffs (followed by the much larger White Cliffs of Epes) and dense tree forests along the banks and then a low-rent mobile-home community. Tom spotted a herd of wild pigs scurrying along the banks. Kingfisher Marina was very nice and we ended up staying two nights instead of just one. Because it was the last “real” marina for the next 250 miles, the marina attracted and welcomed Loopers and many stopped before the last big push to Mobile. Purple barge and matching push boat – really? This is like taking a vacation from my recliner! I love, love, love your blog!!! Thank you so much for taking the time, energy, and using your God-given talent to share your adventure with me! Thanks, Karen. So glad you enjoy them!